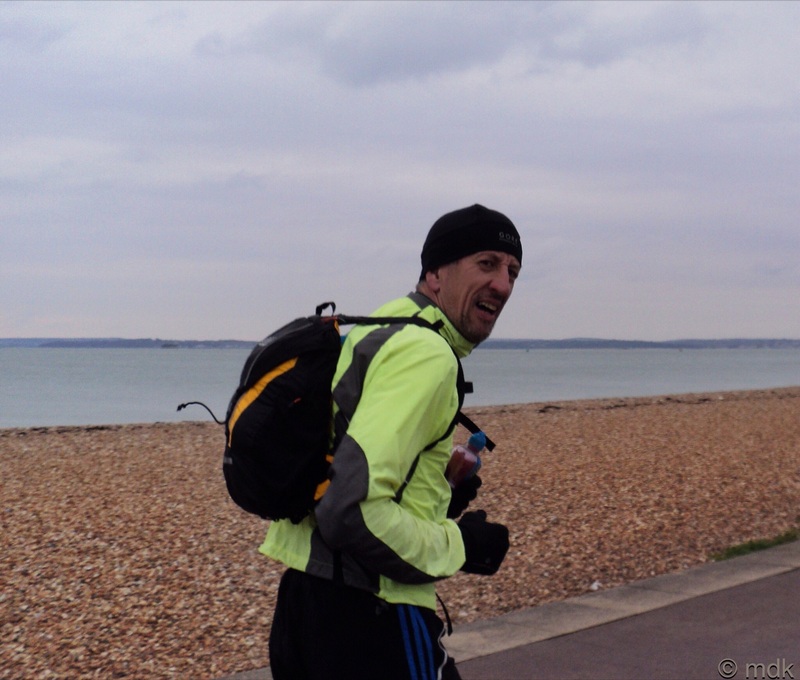 One Sunday morning towards the end of February 2013, Commando said he was going for a run along Southsea seafront. Of course, I tagged along to have a little walk. Commando had borrowed a snazzy gadget from a friend that linked camera to iPad to download photos so, to test it out, I took my real camera rather than my iPhone. If it worked well I might even buy myself one. 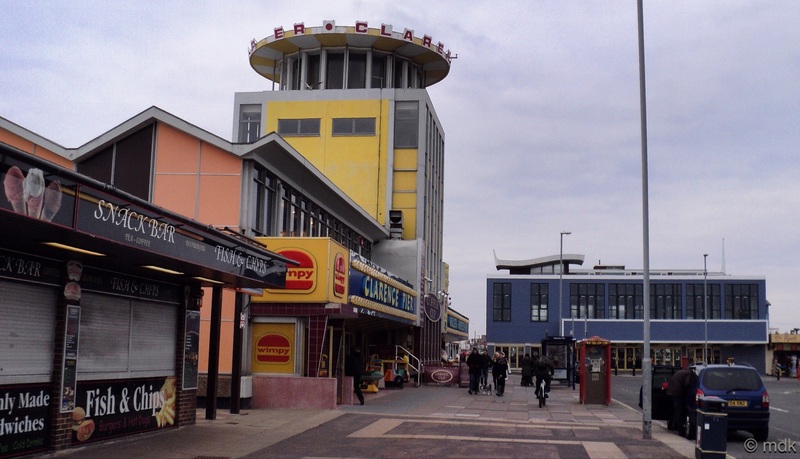 Standing on Clarnence Pier it felt like we’d stepped back in time to a seaside resort in the nineteen sixties. There was even a Wimpey, who knew they still existed? To the best of my memory I haven’t walked along Southsea seafront before, so it made a nice, if rather bizzare, change. As well as the time warp sensation there was a sense we’d also taken a wrong turn and ended up in Iceland. Boy was it cold! I was glad of the padded jacket. Poor Commando was only wearing his thin running jacket and shorts, it made me shiver just looking at him. 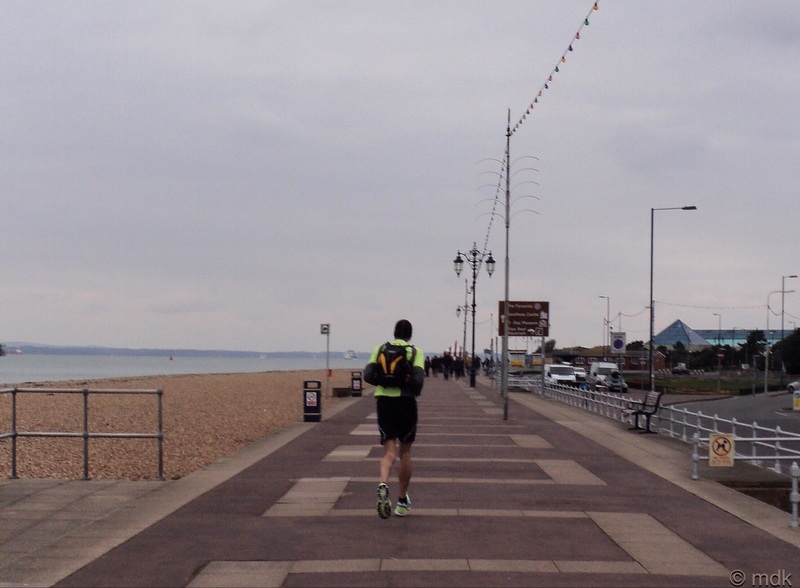 He dashed off into the distance and I set off at a far more sedate pace. Not far from the place Nelson set sail on his final voyage in September 1805, was the Trafalgar Memorial, an anchor from HMS Victory. 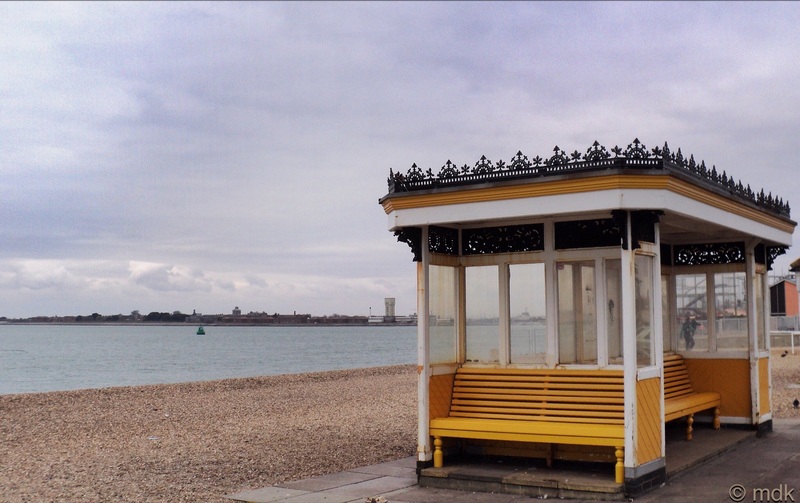 Nearby a strange, bright yellow beach shelter with an ornate wrought iron trim made me think of large women in floral dresses and beehive hairdos writing postcards, just like my childhood. 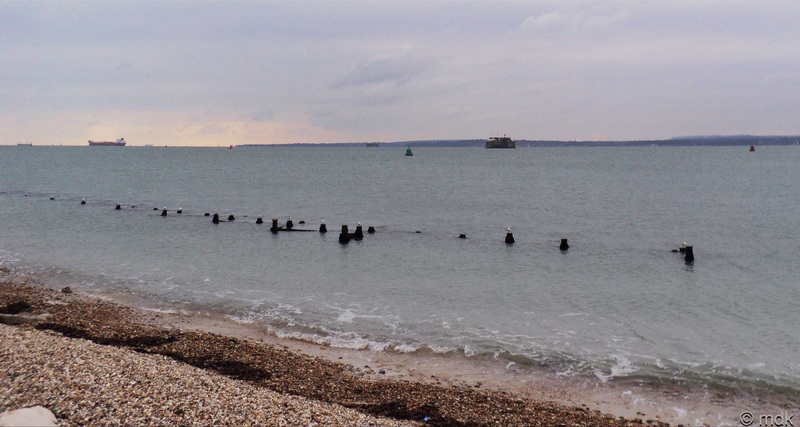 The beach is pebbly, like my own shore but the view is of Gosport or, on a clear day, the Isle of Wight. The Spithead sea forts are also dotted along the horizon like the turrets of castles submerged, Atlantis like, beneath the waves. They were built in the eighteen sixties to protect Portsmouth from attack and now three of the four are privately owned. Imagine owning your own little island castle! The fourth, Spitbank can be visited throughout late spring and summer, maybe I’ll come back and have a little nose. Where are the ladies with beehives? The camera proved to be a struggle. The screen seemed small after the iPhone and I missed the tapping to focus and the touch screen zooming to check out detail but I persevered. The sea was a chilly shade of greyish green, the sky grey and forbidding with just a hint of something that may have been sun, desperately trying to push through and warm the frigid air. The groynes along the edge of the sea were festooned with seagulls looking hunched, cold and rather miserable. I’m pretty sure I’d have been miserable perched on a groyne in the biting wind. I felt sorry for them. A lone, rather stout, seagull, hunkered on the sea wall, his head pulled tight into his shoulders (do seagulls have shoulders?) watching me with a beady eye. 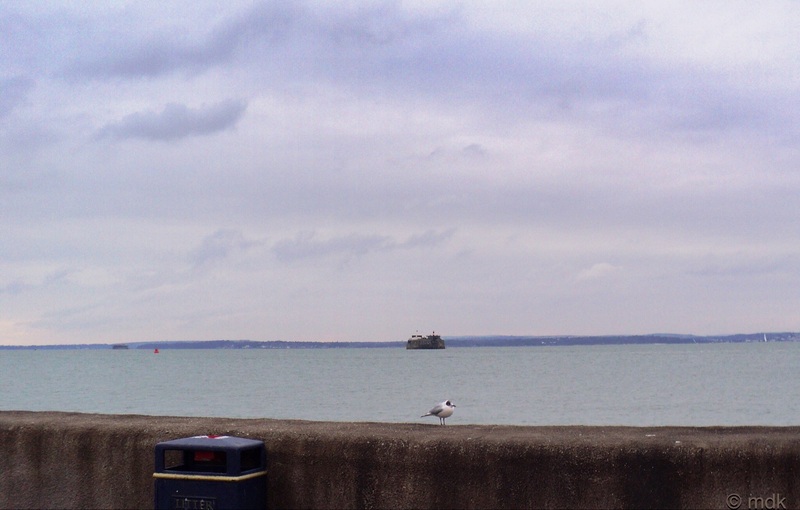 Right behind him was another sea fort guarding the port just as the seagull seemed to be guarding a nearby litter bin. Perhaps he thought I was going to pop my hand in and steal some juicy half eaten sandwich from under his nose. I walked on, leaving him to his vigil. As the coastline began to curve I came to a choice of path, one led away from the sea, following the road, the other along the sea front. 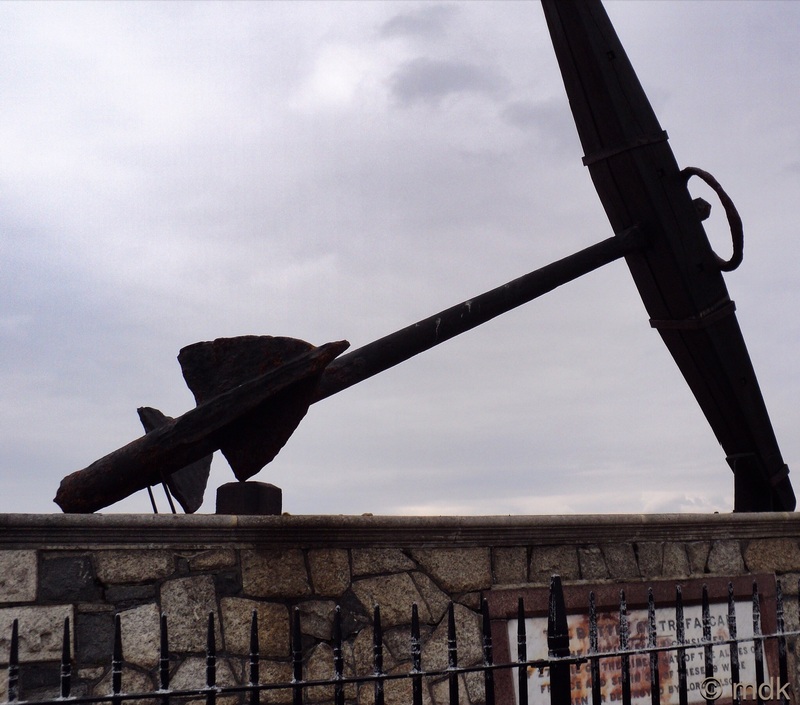 I chose the latter and found a lighthouse perched behind a squat fortlike structure with a cannon pointed out to sea. 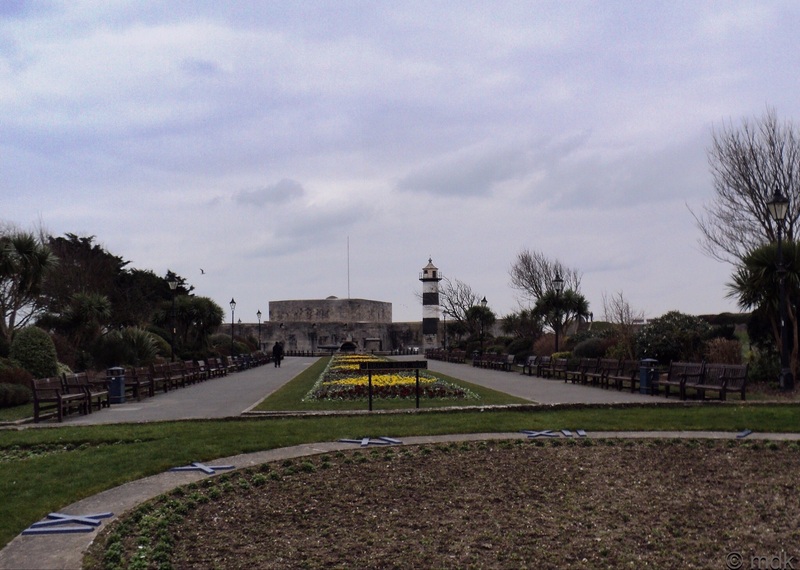 This was Southsea Castle, built by Henry VIII in the mid sixteenth century, the most uncastle like castle I’ve ever seen although it is steeped in history. 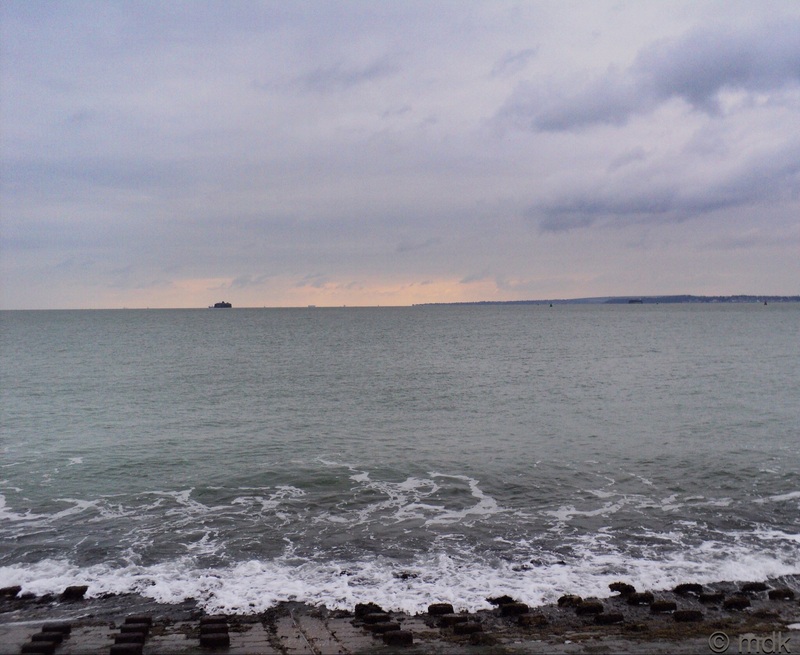 This is the spot where Henry’s Mary Rose was sunk, just after the castle was completed. Maybe this was an omen. The place has been dogged by disaster and misfortune ever since. Eighty one years later a terrible fire destroyed most of the wooden buildings and, in the panic to escape exploding gunpowder, several ships ran aground. Ironically, there was no ammunition there at the time. Fourteen years on another fire destroyed more internal buildings. Fast forward a hundred and nineteen years and fire wreaked havoc again. Now the place was stuffed to the gills with gunpowder. Embers from a cooking fire above the munitions store fell through gaps in wooden floorboards. The explosion caused several deaths. Maybe they should have worked out a wooden structure was not a good idea by then but at least they stopped storing the gunpowder there. The lighthouse was added at the beginning of the nineteenth century and today the castle is a museum that can be hired for wedding receptions and events. Hopefully they have adequate fire precautions in place! 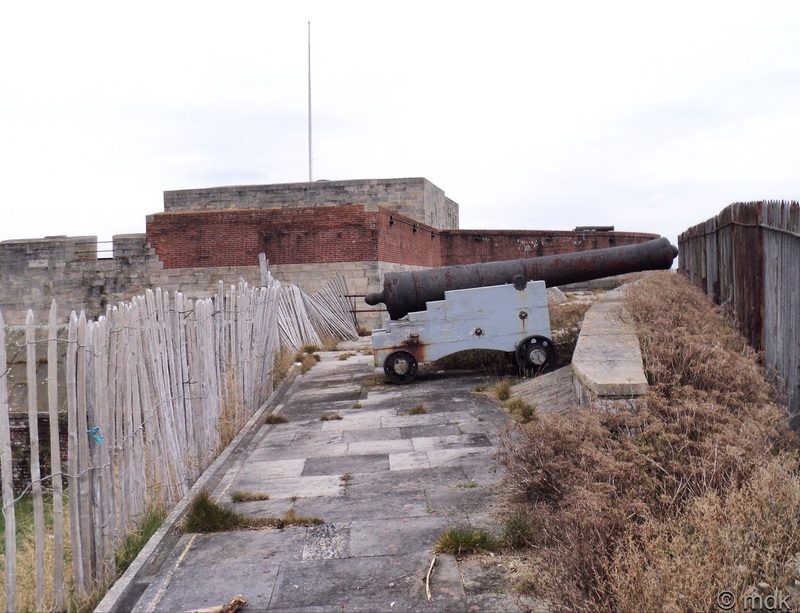 As I passed I peeked through the fence at the cannons standing guard, if I’d known the history it might have struck me an an irony that the biggest danger seemed to lie within. Rounding the bend, I could see the pier sprawling into the sea. Beside me waves lapped at the groyne clad revetments while sun battled with grey clouds. 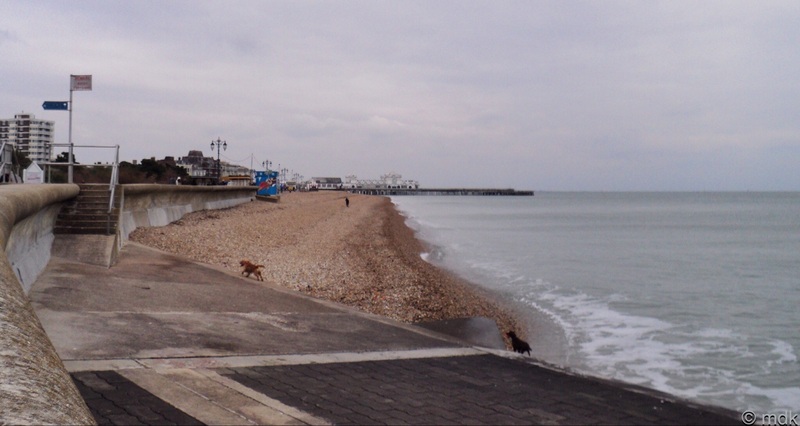 Two dogs were frolicking in and out of the waves, chasing each other up and down the beach. They seemed to be having a wonderful time although I can’t say I fancied a dip in the freezing sea. Not long after, I passed another ornate beach shelter. Behind it I could see gardens and I toyed with the idea of strolling through them but, in the end, decided against it. If I went into the gardens it would be too easy to get distracted and leave Commando shivering at Clarence Pier waiting for me. Regretfully leaving the gardens behind I carried on towards the pier. It had looked quite grand from a distance but grew ever more dilapidated the closer I got. From the front, it was boarded up and everything but for a single ice cream parlour seemed to have been long abandoned. Much as I like ice cream it really wasn’t the weather for it and I wondered if they were doing much trade. This was where I meant to turn, but I spied something I really couldn’t resist. Not a coffee emporium or a chocolatier but a little pond with swans. What would one of my walks be without swans? Commando and I met at the White Swan pub so they are almost an emblem. If I had a coat of arms there would most certainly be swans on it. As I’d been ambling along I reasoned I could push the pace on the return and still make it back in time… maybe. 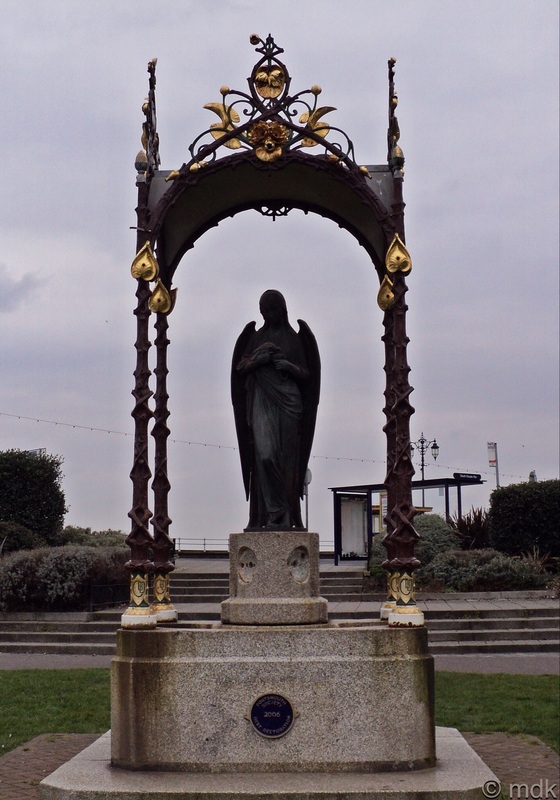 A beautiful bronze angel looked over the lake surrounded by a gilded canopy. From the front she appeared to be cradling a dove. Yet again I cursed the camera. With the iPhone I’d have been able to tap to adjust her shadowy face. 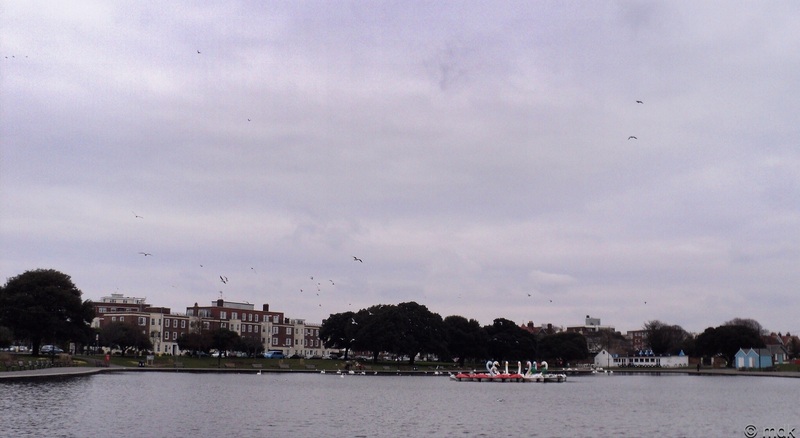 In the centre of the lake a cluster of colourful swan canoes gathered, seagulls circled above them. Better still, real swans were swimming behind them. Of course I had to walk around to have a closer look, the walk back was going to be a sprint at this rate. 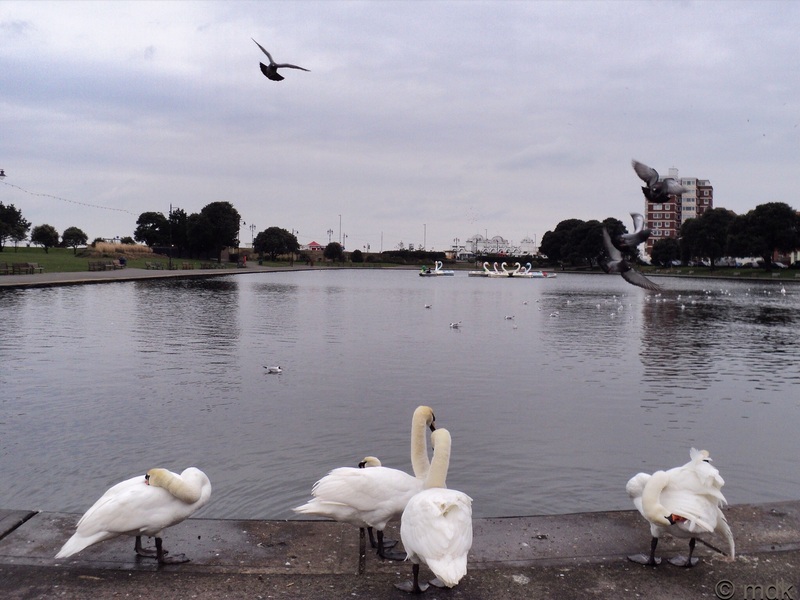 A group of swans had left the water and were grooming themselves. One was quite intent on stalking a golden Labrador that had strayed too close. Luckily, the Labrador wasn’t daft enough to think it could take on a swan and was making an attempt to look nonchalant as it retreated. I sneaked behind the swan while it wasn’t looking, hoping it wouldn’t notice and turn on me. 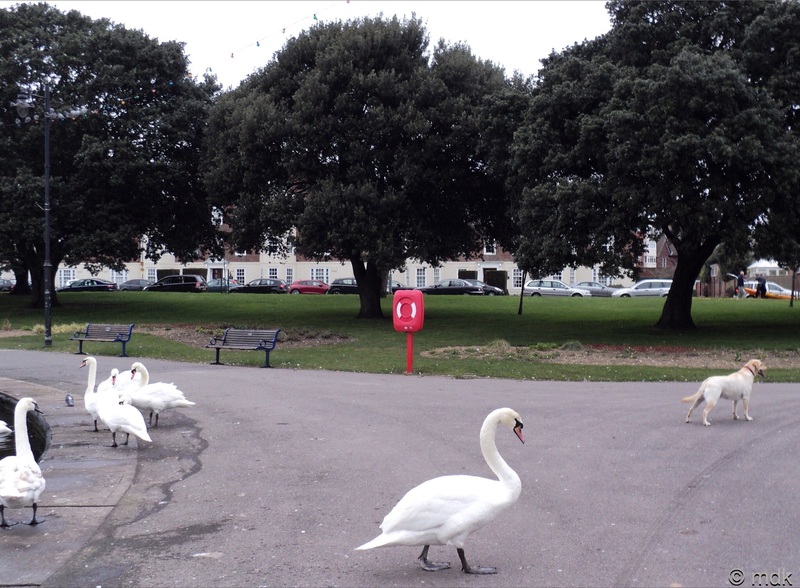 Much as I love swans I wouldn’t want to confront one. The swan was far too preoccupied with the dog so I took the opportunity to take a photo of the others, twisting their necks at impossible angles to preen their feathers. 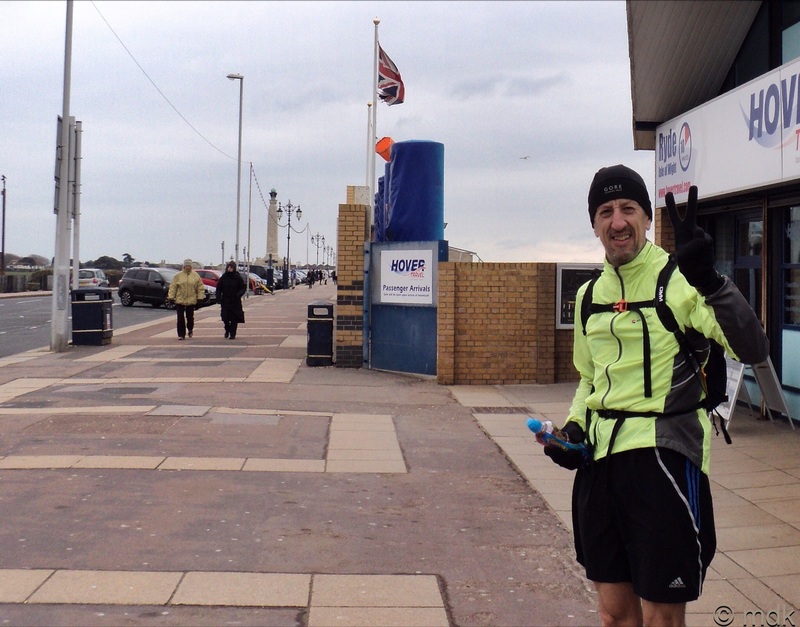 Back on the sea front, not long after I’d passed the pier, I was overtaken by Commando on his way back. He turned and smiled but he looked frozen as he sped off into the distance and I upped my speed several notches. As I saw him taking the road route rather then the longer, sea path in front of the non-castle, I thought I’d better follow suit. Of course this gave me a better view of the gardens I’d passed so regretfully earlier. 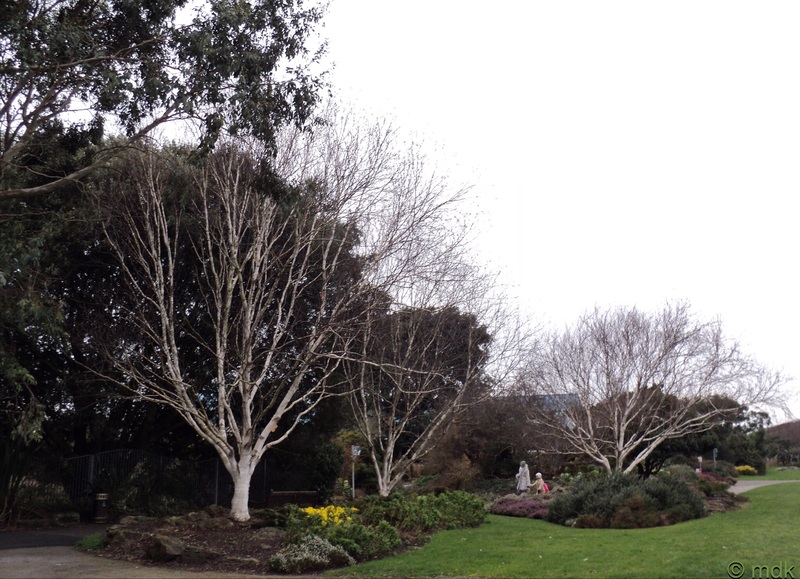 A stand of silver birches caught my eye, their bare white branches contrasting against a backdrop of eucalyptus. 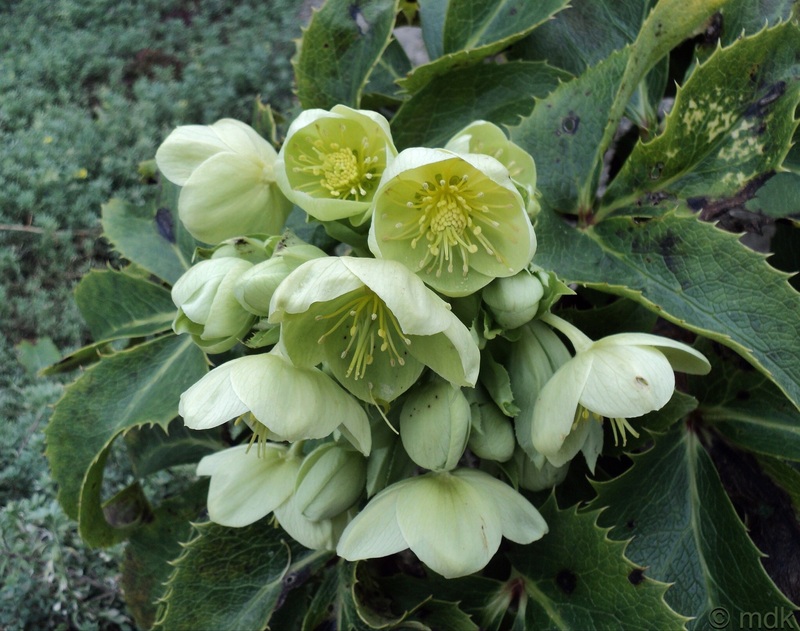 Then I was stopped in my tracks by the most beautiful Hellebore, with heads of yellow green flowers whose stamens and anthers reminded me of elaborate chandeliers. 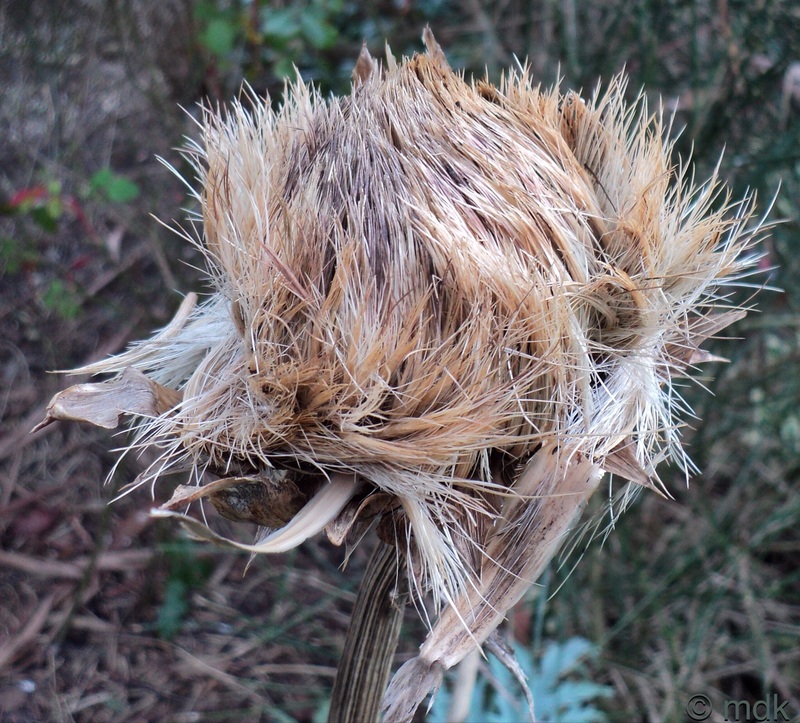 Next was an artichoke thistle, a crown of showy blue green leaves, the stems twisting skywards with untidy brushes of dried flower heads reminding me of my hair in the morning. With the iPhone focusing would have been so much easier and I felt the results were not as crisp. Despite the futility of catching up with Commando I tried my best not to loiter too long. 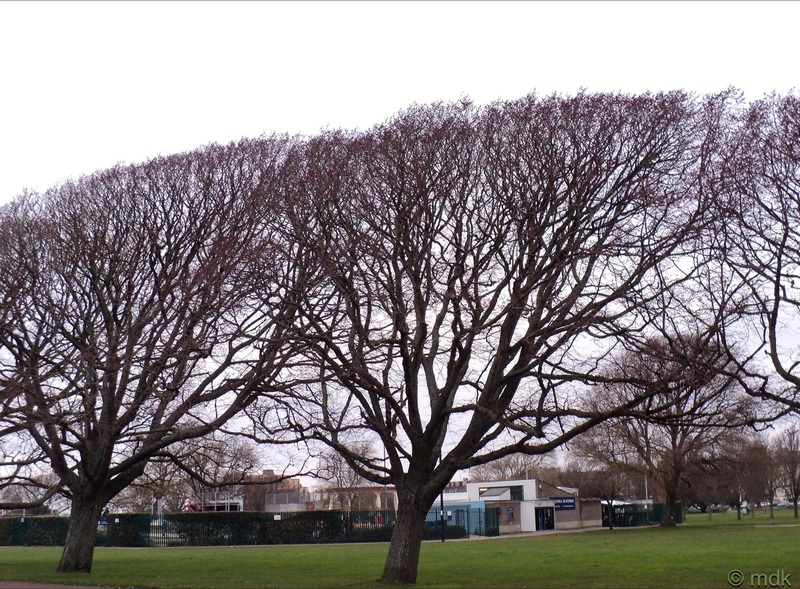 This was hard with so much to see, like the trees all leaning at the same odd angle, sheared off at the top by the cold salt breeze, as if someone had given them a trim with giant scissors. Passing the non-castle from the other side I had a better view of the lighthouse, thrusting into the grey sky. There were gardens in front of it, one a curious round bed, almost bare of flowers but surrounded by roman Roman numerals like a clock face. The next building was the D Day Museum. 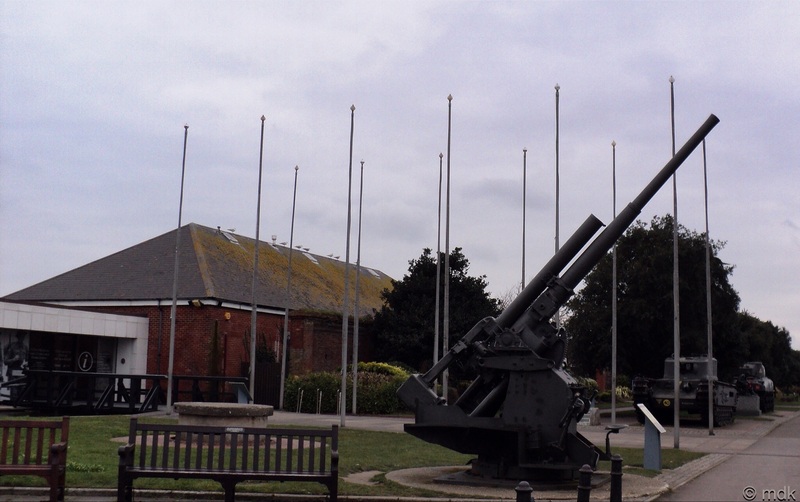 In front of the moss and seagull covered roof a large gun pointed skywards. Two tanks reminded me of all our trips to Normandy and the many museums we’d visited there. Then there was the most poiniant statue of a soldier, head bowed, gun in hand, helmet rested against the rock he sat on. 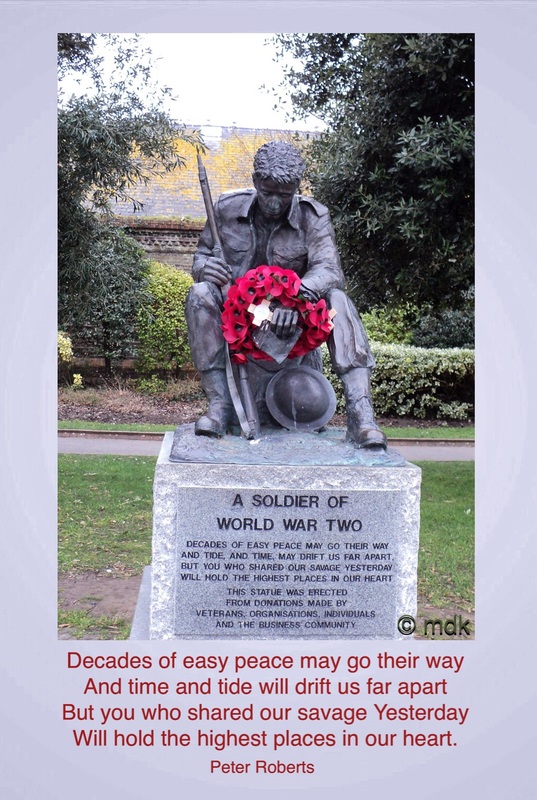 Someone had placed a wreath of poppies around his wrist and a wooden cross in his hand. I stopped long enough to read the poem on the plinth. It was written by Peter Roberts, a young Flight Lieutenant in the RAF when his best friend was killed during the Second World War. A very fitting inscription indeed. I walked the last half mile in a reflective mood. Back at Clarence Pier I soon spotted Commando. He’d found somewhere to change into his warm clothes but his poor hands were frozen solid. He could hardly move them so we went in search of coffee to thaw them out. Round the corner we found a cafe where nothing had changed since at least nineteen fifty something. Framed Betty Boop prints adorned the walls, the seats were fifties diner style vinyl, the music a mixture of old rock and roll songs and, quite bizarrely, banjos. There were a few locals who could all have been transplanted from one of my childhood holidays. They did have coffee, at least they said it was coffee, you couldn’t tell by drinking it. At home when I downloaded my photos I was sorely disappointed. It seems mobile phone technology has far outstripped my one year old camera in quality as well as ease of use. Many of the photos were unusable. I don’t think I’ll be buying one of those gadgets any time soon. M y sister lives in Southsea so I am familiar with the sights, it was nice to see them while I was sitting peacefully at home! It’s a nice place to live I think but I wish they’d reopen the pier. That would be the icing on the cake. I didn’t think those shots were bad at all. Thank you. I never did get the old camera out again though. The phone is so much easier to use and I always have it with me anyway.